During the school holidays I took my kids to the Wild Ropes Course at Taronga Zoo. I thought that this would be a good distraction from the daily hospital visits and everything else that was going on in our lives. I realised that I got more than I expected with this holiday activity. I have done zip-lining before so I thought that high ropes would be much the same, well that was my first mistake. Let me first tell you that I am afraid of heights, more specifically I am afraid of falling from any height. But having been zip-lining before I knew that the harness would stop me from falling, so I was semi-comfortable with this activity. So off we went, I was all harnessed up and connected to the safety line and then I had to step out on to a very narrow suspension bridge. The first step appeared to be so large, but it was okay I trusted that the harness would keep me safe. I managed to get over the first bridge by holding onto the ropes that ran along both sides of the bridge. The next bridge wasn’t so easy, this one didn’t have any side ropes to hold onto, just the wobbly boards to step on with each board being almost 1 metre apart. 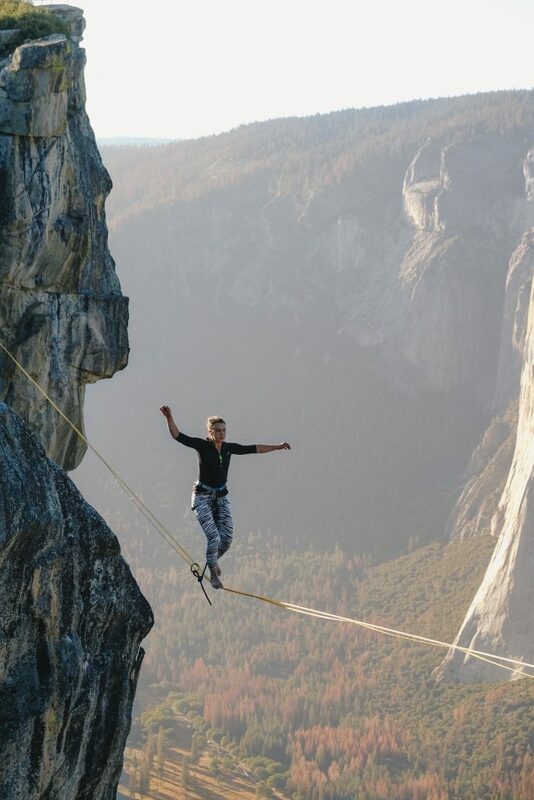 I took a great big breath and stepped out onto the first board, I was holding onto my harness rope as if my life depended on it, which I thought that it did. You see, even though I trusted that the harness would stop me from falling to the ground I didn’t know what would happen if I did fall off any of the obstacles. I thought that I would be left dangling below the course and someone would have to rescue me. The thought of being rescued terrified me. Also having a dodgy hip meant that I thought I would not be able to climb back up to the platform if I needed to. Even though I trusted the harness to keep me alive, I didn’t trust what would happen should I fall. I found out later from my 12 year old daughter that if I had fallen off the obstacle that I would have remained above the course and all I needed to do would be to put my feet back down again and I would have been safe. Lesson – my belief wasn’t the reality. I recently realised that this is a pattern in my life. I hope that the Universe has my back but I don’t completely trust in the Universe. I have a fear of what would happen if I did fall, would I be able to make it back to safety again. This fear comes from not knowing. The fear comes from my belief that I am not completely safe. I think that if someone had told me before I went on the high ropes what would happen if I fell I would have been more relaxed and more okay with falling. But in life we often don’t know what is going to happen, and while we can look to others when things happen their story is not your story. My body reminds me on a regular basis about my beliefs around being safe. I ‘hold on’ in the muscles, joints and ligaments of my hip. For years I have lived in pain and now I realise why I have struggled to get rid of the pain. My pain is a portal, a message, that when I listen to it will reveal the next greatest version of myself. The first step in this transformation is acknowledging the limiting belief that I have. The belief that I am not safe if I fall, the belief that I will not be able to get back up if I fall, that regardless of what type of harness I am wearing I am still not safe enough. These beliefs are not true but they have shaped my reality in the past. The next step on my journey is to process the emotions that these beliefs have bought up for me and to create a new reality. A reality where I trust and know with all my being that I am safe. PS if you have limiting beliefs that are holding you back, even if you don’t know what these beliefs are, contact me at angela@angelacounsel.com and I will share with you the tools that I use to clear my beliefs and manifest the life of my dreams.